The Ottawa Senators began their 2014-15 pre-season on Monday, playing two split-squad games against the New York Islanders at the Mile One Centre in St. John’s, Newfoundland. Despite dressing one considerably stronger squad, the Senators stumbled to the same result in both games, dropping a pair of 3-2 decisions, the latter in a shoot-out. In the early game of the two, the Senators failed to hang on to a 2-2 deadlock, surrendering a late Islanders goal to seal the 3-2 win. 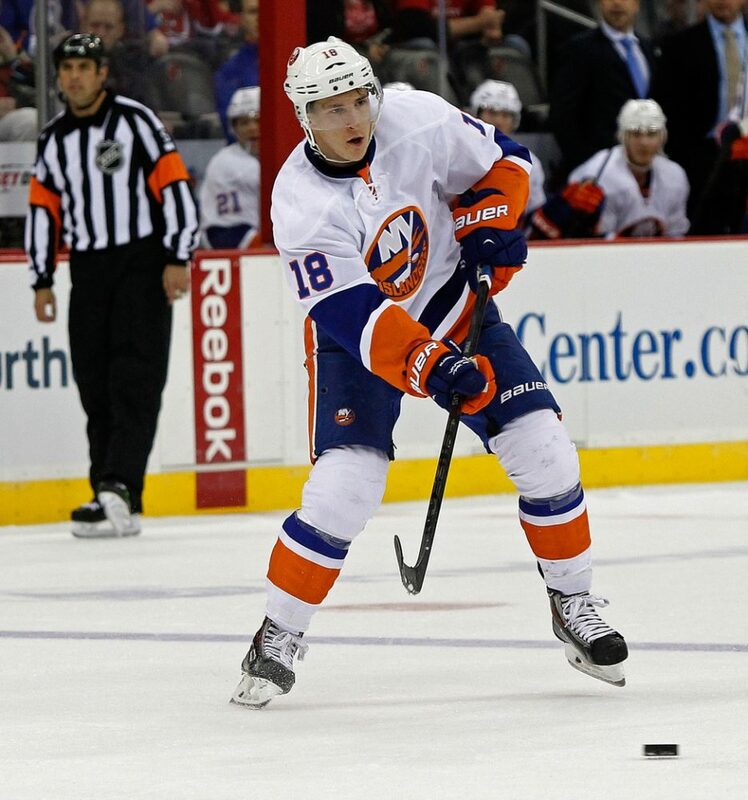 Jack Skille scored his first of the pre-season with 1:27 left to give the Islanders their first pre-season win. Brock Nelson opened the scoring with a power play goal less than a minute in to the game to give the Islanders an early lead. Yet the Senators replied quickly, as Alex Chiasson netted his first goal in his first game in an Ottawa uniform, a mere four minutes later. Assists were awarded to Mika Zibanejad and Milan Michalek. The period ended with no other scoring; simply a bevy of minor penalties, a total of seven to conclude a un-disciplined first period. The second period began slowly, with little scoring opportunities for each team. Yet the Islanders jumped ahead once again on a goal scored by Sebastian Collberg, assisted Kevin Czuczman and Brock Nelson, Nelson’s second point of the afternoon. Similar to the first period however, the Senators were quick to reply, as Cole Schneider scored two minutes later to tie the game at 2, with assists going to J-G Pageau and Shane Prince. The second period also saw a spirited fight between Buddy Robinson and Scott Mayfield, a bout which seemed to energize both teams, leading to some chippy play heading into the third stanza. The final period saw a pick up in terms of offensive chances, yet neither team were able to benefit as the score remained at 2-2. Rough play continued into the third, with roughing penalties resulting from the increased intensity level and physicality between the teams. Jack Skille then scored with only 1:27 left in the third to break the tie, and despite some furious chances by the Senators, stood as the game winning goal as Ottawa dropped the first game of two on the day. In the second of the two games, Ottawa featured a stronger team comprised of players who are either locks to make the team, or are on the verge of winning a full-time roster spot. Craig Anderson and Robin Lehner split the game, while Erik Karlsson, Clarke MacArthur, Kyle Turris and David Legwand all suited up for the Senators, alongside rookie standouts Mark Stone, Curtis Lazar and Matt Puempel. Unlike the early game, the Senators got off to a good start, scoring an early powerplay goal with Mikhail Grabovski serving a tripping penalty. MacArthur got the Senators on the board, assisted by Mark Stone and 2013 line-mate Kyle Turris. After a flurry of stick related minor penalties to both teams, Curtis Lazar added another powerplay goal with ex-Senator Cory Conacher in the box for slashing. Lazar continued to make a strong case to make the Senators out of camp, whose goal was assisted by newest Senator David Legwand and impressive rookie Matt Puempel. The second period started with an early goal by Mikhail Grabovski, assisted by former Leaf team-mate Nikolai Kulemin. The Senators carried the play offensively for most of the period, yet fell behind late on a goal by Josh Bailey, assisted by Grabovski, his second point of the game. The final period began with an early Islanders penalty. 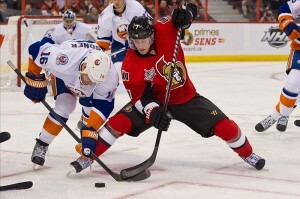 The Senators had some great offensive chances, putting plenty of puck on net, yet were unable to break the tie. Both teams enjoyed some time on the powerplay, yet neither were unable to find any further success despite some great scoring chances for both teams. A late David Legwand high-sticking penalty gave the Islanders a late opportunity to steal a win, yet solid defending and Senators goaltending resulted in a 2-2 stalemate at the end of the third. The overtime was a fast paced 5 minutes of hockey. The Senators had a ton of high quality scoring chances, especially early in extra time, posting six shots on goal in just under a minute of play, yet were unable to end it. The two teams traded scoring chances late, but the game remained tied and headed to a shootout. None of the first six shooters were able to bulge the twine, forcing extra shooters. Josh Bailey continued his strong game, scoring to force the Senators’ to respond. Fortunately for the Sens, Colin Greening was able to beat Kevin Poulin to extend the shoot-out. 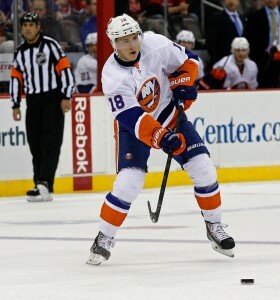 However, a Cal Clutterbuck goal and Matt Puempel miss ended the game, as the Islanders won both games at a score of 3-2. The Ottawa Senators continue their pre-season on Wednesday, September the 24th with a pair of split-squad games against long-time rival the Toronto Maple Leafs.